Tony Romo and the Dallas Cowboys face a key matchup with the Green Packers in the FOX Game of the Week. Ronald Reagan’s favorite joke was about an optimistic kid who saw a room full of manure. He jumped into the pile and started digging around. “There’s got to be a pony in there somewhere!” he squealed. Tony Romo, there’s your role model. The Dallas Cowboys are helmet-deep in manure going into Sunday’s game crucial FOX Game of the Week against the Green Bay Packers. 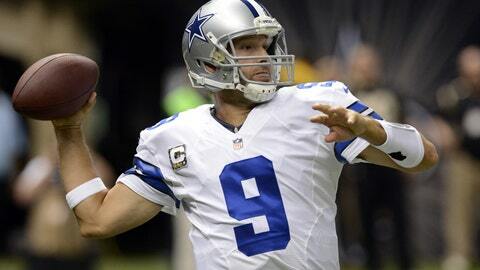 It looks and smells bad from the outside, but it’s a fabulous opportunity for Romo. The immediate fight is with Green Bay, which needs a win as badly as Dallas to keep pace in its division. Romo’s larger battle is with his choking image. He’s having a great year, yet the only thing most people remember is the interception he threw at the end of the Denver game. He had three touchdown passes and no interceptions Monday night in a loss to the Bears. Afterward, the prevailing stories were how the Cowboys’ defense smells to high heaven and Romo can’t win after Thanksgiving. His career record in December dropped to 11-16. Romo has had plenty of help getting to those numbers. What’s abundantly clear is that Jerry Jones came up with another bad idea. He fired blitz-crazy Rex Ryan as defensive coordinator after last season and brought in 73-year-old Monte Kiffin to simplify things. The defense is so simple now a third-grader could read it. Josh McCown looked like Aaron Rodgers in Monday night’s 45-28 embarrassment. Rodgers might look like Rodgers if he’s recovered from a broken collarbone and gets to play Sunday. If not, Matt Flynn will face a defense on pace to be the worst in NFL history. It’s not just the scheme, it’s the injuries. When you have an undrafted rookie from Saginaw Valley State trying to cover Brandon Marshall, your roster needs a faith healer. They had none against Chicago. Zero. As in the Bears never had to punt. Joe Montana couldn’t win with that kind of smelly defense. And as Romo’s critics point out, he’s no Joe Montana. Joe Cool never gagged in the clutch. There’s no doubt Romo has come up small in some big moments. The narrative began in the 2007 playoffs, when he fumbled the snap on a potential game-winning field goal at Seattle. Enough high-profile failures followed to forge an image. Now, Romo gets blamed for everything except global warming. His performance Monday night wasn’t great. But when a quarterback has three TDs and no interceptions, he’s not the problem. Since 2009, Romo has 30 touchdowns and five interceptions in December games. His passer rating is second only to Rodgers. Romo had four touchdowns and no interception in two of those games. The Cowboys lost both. If he’d thrown eight interceptions in those games and Dallas had won, maybe it would have helped his image. Then life is great in Dallas right now. If Romo can pull a pony out this manure pile, nobody can call him a choker ever again.